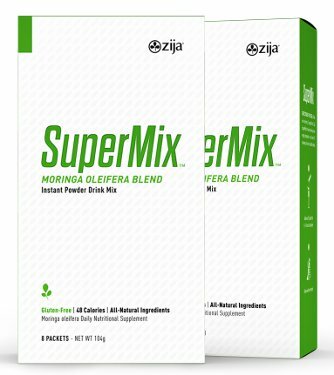 Shake things up with Zija's SuperMix, an easy-to-open packet that you can add to water for more than two times the pure Moringa nutrition compared to Zija SmartMix! Zija SuperMix - Drink Life In! SuperMix is packed with two times the Moringa in the purest form available on the market, so it's overflowing with cell-ready nutrients, antioxidants, minerals, omega oils and vital proteins. 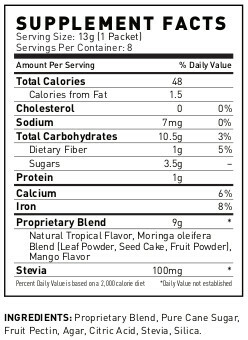 Zija is the first – and only – company to channel Moringa's dramatic nutritional properties into a refreshing and nourishing beverage that helps you maintain a healthy, active and balanced lifestyle just as nature intended. Zija SuperMix Nutritionals Get healthy, stay healthy, lose weight, and be more active with this great tasting mix. Add one packet to 600mL of cold water and shake well. 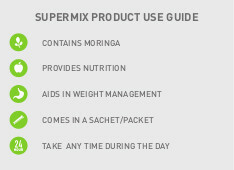 Drink one serving of Zija Super Mix in the morning on an empty stomach, or at least 15 minutes prior to a healthy meal. Zija is the best lifestyle change you can make, because when you give your body proper nutrition it has the amazing ability to restore itself! Zija International and Team Drink Moringa do not claim Zija products diagnose, treat, cure, or mitigate any disease, class of disease, or ailment.